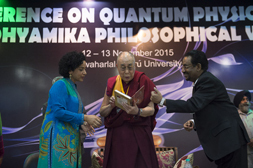 A two-day conference on Quantum Physics and Cittamatra and Madhyamika Philosophical Views of Buddhism was held at the Convention Center of Jawaharlal Nehru University (JNU) in Delhi on 12th and 13th November 2015. 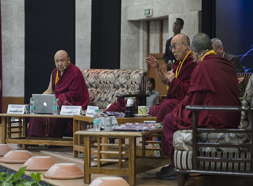 His Holiness the Dalai Lama was invited to participate in the panel discussions along with eighteen other reputed scholars of different fields of knowledge. 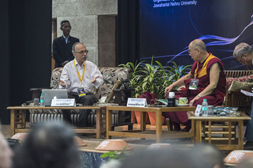 The conference was organized by Jawaharlal Nehru University, one of the most prestigious universities in India, and co-sponsored by the Dalai Lama Trust India. 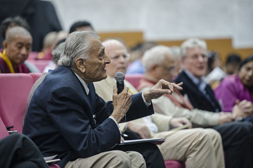 The conference was attended by 450 enthusiastic audience comprising professors and students of the University and other invited guest scholars and observers, to grab this rare and unique opportunity for intellectuals to exchange or express their own critical perspectives and findings on the related topics presented by well-known experts from different fields of knowledge. There were occasions for exploring further during the Q&A Sessions. The core emp hasis of this conference was comparing two of the most radical critiques of metaphysical views and essentialism that have been proposed in the history of human thought, i.e. 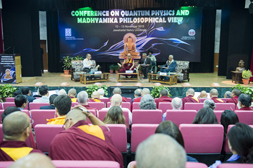 Quantum Physics and Madhyamika Philosophy on which twelve related topics were discussed thoroughly these two days. The first day program commenced with introductory speech by Prof Prasant Sen, Rector of JNU and welcome note by Prof S.K. Soporoy, Vice Chancellor of JNU which were followed by a speech of His Holiness the Dalai Lama, highlighting his curiosity about science and interest in mechanical things since his childhood. His Holiness also mentioned that he had so many opportunities to meet with people from many different backgrounds, including scientists. He continued mentioning about the mutual benefits from the series of dialogues initiated by him which fundamentally focused on Cosmology, Neurobiology, Physics, particularly, Quantum Physics, and Psychology. Through these discussions and dialogues, scientists have learned more about the mind and emotions, while we have gained a subtler explanation of matter, including the human brain structure. The first session of the day chaired by Prof N. Mukunda featured the presentation of French Professor Michel Bitbol’s paper on Quantum Physics: Interdependence and the No-view Stance. Gesh Ngawang Samten chaired the second session of the day which featured Geshe Ngawang Sangye’s paper on Concerning Cittramatrin View of Emptiness. After each session, several questions from the audience were sought and answered. The first afternoon session was started by Prof Mathew Chandrankunnel’s discussion on The Ontology and Epistemology of Reality according to Quantum Mechanic and Madhyamika Buddhism chaired by Prof Rajram Nityananda. That was followed by Ven. Geshe Lobsang Tenpe Gyaltsen on the theme of What is the Buddhist Perspective of the World and its Beings. The day’s program concluded with Geshe Chisa Drungchen Tulku talking on The Two Truths: A Prasangika Perspective. 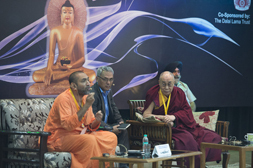 The second day programme began with the release of two books by His Holiness the Dalai Lama. 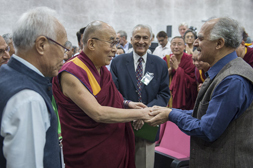 The first book contained a compilation of tributes and recollections about AP Venkateswaran, a former Foreign Secretary in the Government of India, and the second book was Changes on the Roof of the World-Reflections on Tibet, a compilation of research articles written by PhD candidates of Tibetan ethnicity at JNU. The confere nce resumed with Prof. Sundar Sarukkai reading a paper about Wave-Particle Duality and Nagarjuna’s Mulamadhyamika Karika or Fundamental Treatise on the Middle Way, followed by Geshe Jangchub Sangay of Gaden Monastic University reading a paper on Dependent Origination: The Absence of Intrinsic Existence and Tenability of Conventional Phenomena According to Prasangka Madhyamika or Middle Way Consequentialist System. The morning session ended with Mahan Maharaj, an Indian mathematician and swami giving explanation on his theme The Algebra-Geometry Duality. The afternoon session of Day 2 began with Prof. Arthur Zajonc speaking about the Experimental Foundations of Quantum Physics by quoting Goethe’s saying of “Every object well contemplated opens a new organ in us” and other perspectives of quantum physics as well. As the conference came to its end, Dr. Brijish Kurma (Kumar?) reviewed some of the points made by Michel Bitbol, Sundar Sarukkai, Mathew Chandrankunnel, Mahan Maharaj and Arthur Zajonc on the side of Science. Whereas Geshe Lhakdor in his turn reviewed what the Buddhist scholars presented. 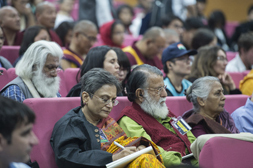 The two-day conference was concluded with His Holiness the Dalai Lama making the final remarks by repeating the Buddha’s advice not to accept what he had said at face value but to investigate it. He also thanked the University, its officials and staff, the organizers and volunteers for providing this opportunity. He continued by saying “That we have to be careful that new forms of knowledge don’t just become tools of our anger and fear, that they don’t merely increase our destructive power. We need to remind ourselves that our own future depends on the rest of humanity”. Prof Renuka Singh then offered formal note of thanks to all the participants and thus the conference ended.